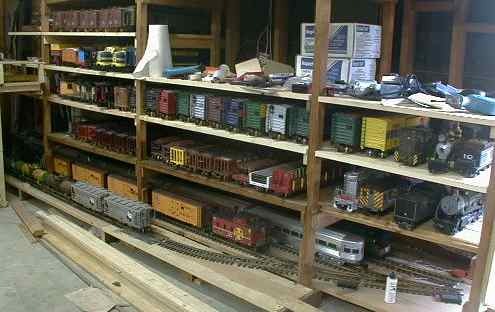 When not in use, the trains are stored in the garage. A track runs down the side of the house and a removable bridge can be placed in the side door of the garage to allow whole trains to be taken out and put away in minutes. The yard itself has four tracks that match the length of the four tracks in the main yard in the backyard. The remote interlocking control system allows all train movements to be controlled while the operator is standing in or near the garage. The outer most track is also a "make-up" track which is not under a shelf and has easy access. Cars and engines from the shelves above can be made up into new trains quickly.